About 4 miles West South West of St. Alban’s Head lie the remains of a large iron steamship recently identified as Netley Abbey. Reading the reports of the aftermath of the accident during the research process one can see how, over 100 years later, some things do not change. There is always the search for blame, different sides in the press close ranks, and reporting is not always accurate. After the accident, Commander Frederick William Fane-Hervey and Navigating Lieutenant George P. Ross, of HMS Surprise, were charged with having negligently, or by default, hazarded or suffered to be hazarded, HMS Surprise. The Court Martial, held aboard HMS Victory, acquitted Lieutenant Ross finding the charge against him not proved but found the case against Commander Fane-Hervey partly proved because HMS Surprise’s engines were not eased after entering a thick fog. The Court merely admonished Commander Fane-Hervey to be more careful in future although they regarded the bad handling of Netley Abbey and the failure to sound the siren in accordance with regulations as the primary cause of the collision. Although a comprehensive account can be deduced from the newspaper reports of the time there are considerable discrepancies in some of the reports, especially relating to the reported positions which differ considerably. Interviewed shortly after the collision, Captain Lewis of Netley Abbey reported his position at the time to be ‘... between 8 and 10 miles east by south half S (magnetic) of the Shambles lightship’ (@108° M). However, the rest of the civilian press appears to have shortened this to a more general ‘The collision occurred off the Shambles lightship during a dense fog’. The proximity to the Shambles lightship has since become the generally accepted and reported position of the collision. Much of the military press, presumably relying more on information from HMS Surprise, continued to state the position as off St Alban’s Head. The log of HMS Surprise covering the date of the collision was available from The National Archives. Although it is not possible to accurately reconstruct the track of the vessel from the information available, an estimate of the general position of HMS Surprise at the time of collision and sinking can be made to determine which position reported in the newspapers is most likely correct. Similarly an alternative position N50° 31'.5 W002° 00'.1 can be calculated for the start of their return journey back to the South West Shingles buoy. These positions are over three miles apart but this could be explained by tidal corrections or other assumptions made when interpreting the log of HMS Surprise. They are however in the vicinity of St Alban’s Head and close to the position of the wreck which is four miles SSW (202.5º) from St Alban’s Head. As mentioned earlier Captain Lewis of Netley Abbey stated his position to be ‘between 8 and 10 miles east by south half S (magnetic) of the Shambles lightship’. 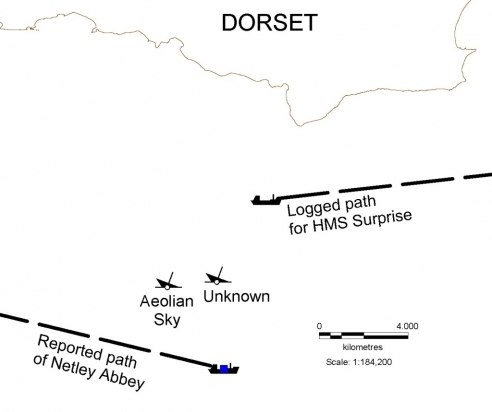 At the time the Shambles lightship was positioned at 50° 30' 50"N 002° 20'W, (N50° 30.8', W002° 20') again providing a final position for Netley Abbey close to the position of the wreck. Hampshire Telegraph & Naval Chronicle, 12 Aug. 1899, 19 Aug. 1899; 26 Aug. 1899. Dorset County Chronicle, 10 August 1899. Pers Comm, Neil Jones, Trinity House. Hydrographic Office, Taunton, Chart No. 2614, Bill of Portland to St Albans Head, 1872.